The Central Eastern Wheatbelt played a significant role in preparing for the defence of Australia in World War 2. Merredin hosted an Army Field Hospital and many RAAF installations, while Nungarin had a large Army Ordance Depot based near the town. A major flight training base was located at Cunderdin. Cunderdin Airfield was constructed early in World War II as an elementary training school for ab initio pilots for the Empire Air Training Scheme (EATS). The facility comprised a large airfield, hangars and technical huts together with a main base camp further to the east. Towards the end of the war, after sufficient pilots had been trained for both EATS and RAAF requirements in the South West Pacific, the airfield was used as an operational base for heavy bombers in connection with the campaign against the Japanese occupied Netherlands East Indies. Following the war the base was used as a migrant camp and in 1957 the Commonwealth began disposing of some assets at the base and ownership of some of the buildings passed into private hands including the Gliding Club of WA which purchased Building 109. The original airfield comprised three main areas – the Movement Area, the Hangar Area and the Camp Area. The Camp Area is no longer a part of the airfield and now houses the Agricultural College. In 1992 the remaining land at the airfield (but excluding land for the Junior Agricultural High School and some other adjustments) was transferred to the Shire of Cunderdin under a special agreement with the Commonwealth. Located off Benson Rd, The remains of the former field Hospital that was relocated to Merredin from Gaza Ridge, Palestine in 1942 can be viewed in native bushland adjacent to Merredin Peak. Extensive interpretation on site. These tanks can be viewed from the car park of the BP Roadhouse on the Great Eastern Highway. Part of a home has been built on top of the aviation fuel tanks which sit partly above and partly below ground. The tanks held six million litres of fuel used at the Cunderdin Airfield. Located on the Nungarin Merredin Road / Railway Ave. 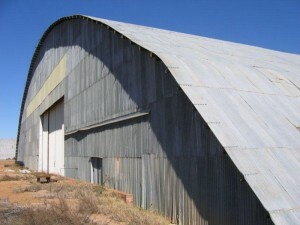 These igloo shaped hangars were part of the RAAF No10 Stores Depot commenced in 1943. The Depot held bulk and technical stores, especially radar and radio spares. Sheets of tin placed on the ground helped camouflage the site as a salt lake. RAAF personnel lived in nearby houses with vegetable gardens and flowers beds rather than barracks, also as a camouflage technique. On Private property, can be viewed from the roadside. Located on the Merredin -Chandler road. In the paddock just past Hunts Dam is the High Frequency Direction Finding Installation, locally known as the Radar Hut. It’s role was to give advance warning of an impending invasion. It is believed to have been completed in February 1945. On Private property, can be viewed from the roadside. Nokaning East Road (gravel road). Scattered rows of rounded concrete buildings set in the paddocks. The 46 concrete igloos were constructed to house a wide range of munitions. You can still make out the numbers on some doors. The area would have been guarded by personnel who lived in approximately 40 timber framed buildings hidden amongst the trees. On Private property, can be viewed from the roadside. 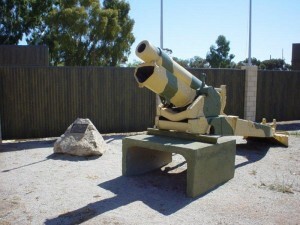 This Museum located on the Great Eastern Highway contains memorablia from all major conflicts since World War 1 and is a great place from which to start your exploration of the Military history of the Wheatbelt. Located in Roy Little Park , Merredin this monument constructed by Wheatbelt Vietnam Veterans was dedicated on Long Tan Day, August 18th 2006, to mark the 40th anniversary of the Battle of Long Tan. Located nine kilometres north of Mukinbudin on the Mukinbudin/Wialki Road. This gateway was constructed in 1947 by Stan Goodchild, the then property owner, in memory of his son Harold who was killed in action in December 1944 while serving with the RAAF. The two 32 volt lights were orginially powered by wires from the distant homestead.The gateway was restored in 2003 with the co-operation of the present owners AL and ME Shadbolt and family and the Shire of Mukinbudin. This facility was constructed in 1942-43 as part of Australia’s defence in World War II . It was considered one of the largest storage facilities for Army Ordnace in Western Australia at the time and cost in the vicinity of ten million pounds. Incorporated in the facility were the Army Vehicle Workshop (now the Shire depot and Military Museum), tank workshops, 5 huge storehouses, powerhouse, post office, administration block, medical facilities, other workshops, shelters, offices and vehicle parking areas. The red brick fire walls of the storehouses remain and can be viewed in the paddocks to the west of the town. 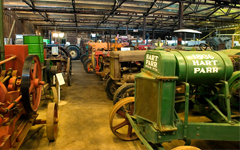 Located in part of the Army Vehicle workshop buidling the museum has an array of military memorablia including a 10th Light Horse collection. There is a rare Dingo scout car, Stuart tank, Bren – gun carrier and various army vehicles and trucks on display and undergoing restoration. 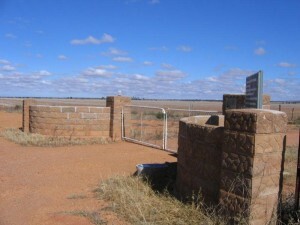 Located in the Shire of Yilgarn south of Southern Cross along the Emu Fence Road is a RAAF Vultee Vengeance dive-bomber crash site. The plane’s engine was buried ten feet in the earth and the wreckage strewn over ten acres. The pilot survived, the navigator has never been found. More information is available in the publication ” Vengeance of the Outback”.